The Aptera dream may fly again with a newly announced three wheeled electric sports car, the TORQ Roadster. The TORQ has been designed by Epic EV, a company founded by Aptera co-founder Chris Anthony, and carries forward many of the ideas Aptera tried to develop. Where the Aptera was shooting for high fuel efficiency, the TORQ Roadster shoots for performance and fun. The TORQ Roadster will go on sale in April and will be available for in-person demonstrations at the Epic EV R&D Center in Vista, CA, Saturday, April 6th from 1pm-5pm. Deliveries will commence in April and the price starts at $65,000 in the United States and €50,000 Europe. In terms of performance, the Roadster has it in spades. According to Epic EV it will do 0-60 miles/hr in under 4 seconds, and the 3 wheeled architecture can achieve over 1G of lateral acceleration. The electric motor provides over 600ft/lbs. of peak torque with a peak horsepower of over 400 hp. It features Wilwood 4-piston race proven brakes and a Formula 1 style high-performance custom cam suspension and chassis, designed by Palatov Motorsports. The battery packs come from another Aptera-connected company, Flux Power. The three wheeled design reduces drag on the tarmac by 25% increasing the vehicle's energy efficiency. The TORQ Roadster has a track width over 80" to improve stability and handling. 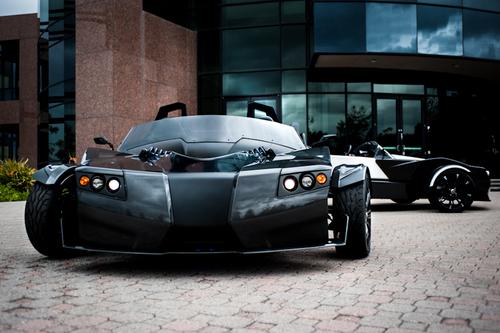 Plans are to produce 50 TORQ Roadsters in 2013 and make a substantial production increase in 2014. Interested parties can place a deposit now, and for the 2014 model year the company will start a waiting list. Epic EV and Flux Power are also behind the electric DeLorean that was announced a year ago. At that time the electric DeLorean was expected to go into production during 2013. Epic EV's core competency is in constructing vehicles using composite materials. These materials are said to be extremely strong while lighter in weight than steel. These features make composite materials popular in airplane and boat construction, but it is not widely used in cars. Ugly, not fast enough, far inferior handling compared to Ariel Electron. Definite failure in the making.